The Chinese Eastern Railway or CER (Chinese: trad. 東清鐵路, simp. 东清铁路, Dōngqīng Tiělù; Russian: Китайско-Восточная железная дорога or КВЖД, Kitaysko-Vostochnaya Zheleznaya Doroga or KVZhD), also known as the Chinese Far East Railway and North Manchuria Railway, is the historical name for a railway across Manchuria (northeastern China). The line was built by Imperial Russia using a concession from the Qing dynasty, and linked Chita with Vladivostok in the Russian Far East. 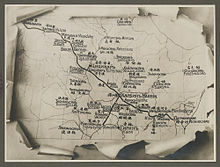 The T-shaped line consisted of three branches: the western branch, now the Harbin–Manzhouli Railway, the eastern branch, now the Harbin–Suifenhe Railway, and the southern branch, now part of the Beijing–Harbin Railway, which intersected in Harbin. The railway and the concession, known as the Chinese Eastern Railway Zone, were administered from the city, which grew into a major rail hub. The southern branch of the CER, which became the South Manchuria Railway in 1906, became the locus and partial casus belli for the Russo-Japanese War, the 1929 Sino-Soviet Conflict, and the Second Sino-Japanese War. The Soviet Union returned the Chinese Eastern Railway to the People's Republic of China in 1952. The Chinese Eastern Railway, a single-track line, provided a shortcut for the world's longest railroad, the Trans-Siberian Railway, from near the Siberian city of Chita, across northern inner Manchuria via Harbin to the Russian port of Vladivostok. This route drastically reduced the travel distance required along the originally proposed main northern route to Vladivostok, which lay completely on Russian soil but was not completed until a decade after the Manchurian "shortcut". In 1896 China granted a construction concession through northern Inner Manchuria under the supervision of Vice Minister of Public Works Xu Jingcheng. Work on the CER began in July 1897 along the line Tarskaya (east of Chita) – Hailar – Harbin – Nikolsk-Ussuriski, and accelerated drastically after Russia concluded a 25-year lease of Liaodong from China in 1898. Officially, traffic on the line started in November 1901, but regular passenger traffic from St. Petersburg to Vladivostok across the Trans-Siberian railway did not commence until July 1903. In 1898, construction of a 550-mile (880 km) spur line, most of which later formed the South Manchuria Railway, began at Harbin, leading southwards through Eastern Manchuria, along the Liaodong Peninsula, to the ice-free deep-water port at Lüshun, which Russia was fortifying and developing into a first-class strategic naval base and marine coaling station for its Far East Fleet and Merchant Marine. This town was known in the west as Port Arthur, and the Russo-Japanese War (1904–1905) was fought largely over who would possess this region and its excellent harbor, as well as whether it would remain open to traders of all nations (Open Door Policy). The Chinese Eastern Railway was essentially completed in 1902, a few years earlier than the stretch around Lake Baikal. Until the Circumbaikal portion was completed (1904–1905; double-tracked, 1914), goods carried on the Trans-Siberian Railway had to be trans-shipped by ferry almost a hundred kilometers across the lake (from Port Baikal to Mysovaya). The Chinese Eastern Railway became important in international relations. After the first Sino-Japanese War of 1894-1895, Russia gained the right to build the Chinese Eastern Railway in Manchuria. They had a large army and occupied Northern Manchuria, which was of some concern to the Japanese. Russia pressed China for a "monopoly of rights" in Manchuria, but China reacted to this by an alliance with Japan and the United States against Russia. During the Russo-Japanese War, Russia lost both the Liaodong Peninsula and much of the South Manchurian branch to Japan. 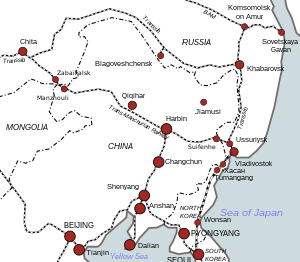 The rail line from Changchun to Lüshun - transferred to Japanese control - became the South Manchuria Railway. During the 1917-1924 (Russian Civil War) the Russian part of the CER came under the administration of the White Army. After 1924, the USSR and China administered the Northern CER jointly, while Japan maintained control of the southern spur line. The Sino-Soviet conflict of 1929 was fought over the administration of the Northern CER. After the establishment of Manchukuo it was known as the North Manchuria Railway until 23 March 1935, when the USSR sold its rights to the railway to the Manchukuo government; it was then merged into the Manchukuo National Railway and converted to standard gauge. From August 1945, the CER again came under the joint control of the USSR and China. Somewhat reversing Russia's stinging losses in 1904-1905, after World War II the Soviet government insisted on occupying the Liaodong Peninsula but allowed joint control over the Southern branch with China; all this together received the name of the "Chinese Changchun Railway" (Russian: Кита́йская Чанчу́ньская желе́зная доро́га). In 1952, the Soviet Union transferred (free of charge) all of its rights to the Chinese Changchun Railway to the People's Republic of China. The flag of the Chinese Eastern Railway is a combination of Chinese and Russian flags. It has changed several times with the political changes of both owners. The first CER flag (1897-1915) was a combination of the triangular version of the flag of the Qing dynasty and the flag of Russia, with East Provinces Railway of Great Qing (大清東省鐵路) in Chinese. The 1915-1925 flag replaced the flag of the Qing dynasty with a triangular version of the five-colored flag, with East Provinces Railway Company of China (中國東省鐵路公司) in Chinese. The flag was changed again in 1925 and 1932, with the flag of the Soviet Union and the flag of Manchukuo added. The only train that covers the entire route is the train #19/20 "Vostok" (translated as "East") Moscow - Beijing. The trip from Moscow to Beijing takes 146 hours. The journey in the opposite direction lasts 143 hours. There is also a train #653/654 Zabaikalsk – Manzhouli which one can use to cross Russian-Chinese border. The trip takes 25 minutes. ^ Zhang, Shengfa. "The Main Causes for the Return of the Changchun Railway to China." In China Learns from the Soviet Union, 1949 - Present, edited by Thomas P. Bernstein and Li Hua-Yu, 61-78. 1st ed. Vol. 1. Lanham, MD: Lexington Books, 2010. Page 61. ^ "Chinese Eastern Railway railway, China". Encyclopædia Britannica. Retrieved 11 December 2016. ^ Zhang Shengfa, "Return of the Chinese Changchun Railway to China by the USSR." In Manchurian Railways and the Opening of China, 171-94. 1st ed. Vol. 1. New York, NY: Taylor & Francis Group, 2010. Page 171. ^ "Chinese Eastern Railway Company (China)". Flags of the World. ^ "Trans-Manchurian Trains". Trans Siberian Express. Walker, Michael. The 1929 Sino-Soviet War (2017). Urbansky, Sören (2008). Kolonialer Wettstreit: Russland, China, Japan und die Ostchinesische Eisenbahn (in German). Frankfurt/New York: Campus Publishers. Moustafine, Mara. Secrets and Spies: The Harbin Files. A Vintage Book. Random House Australia Pty Ltd.
Sedwick, F.R. (R.F.A.) (1909). The Russo-Japanese War. New York: The Macmillan Company. Colliers, ed. (1904). The Russo-Japanese War. New York: P.F. Collier & Son. Guide to the Photograph Album of the Chinese Eastern Railway. Special Collections and Archives, The UC Irvine Libraries, Irvine, California. Views of the Chinese Eastern Railway This album contains 42 photographic prints depicting depots, railroad shops and yards, rolling stock, car interiors, tracks, health resorts, and other views along the line. Captions for the photographs are in Russian, Mandarin, and English.